The first perfumery workshops of the Western world arose in Italy during the Middle Ages, thanks to monks and nuns that created ointments, treatments and remedies to scent the persons and their clothes. During the Renaissance this art spread to the courts, Florence above all, but also Rome, Venice and Mantua. In 1533 Caterina de’ Medici, aged 14 years, married the future king of France, the Duke of Orléans, who was 14 as well. Paris was fascinated by this young Florentine lady with such a special taste. Living in France, Caterina introduced some conforts she was used to, including the fine scents developed by her personal perfumer Renato Bianco; the whole Court fell in love with this fragranced habit, giving impulse to the development of a French perfumery. In the Baroque Age, Florence was proud to have taught the French an art that the city had been already knowing for centuries, an art that it was deemed to preserve and improve never forgetting its tradition. 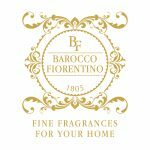 Graziani, candlemakers in Tuscany since 1805, have discovered some ancient recipes for room fragrances daring back to the Baroque Age, have revitalized them and will disclose them step by step: hence the name of this luxury collection, BAROCCO FIORNTINO.